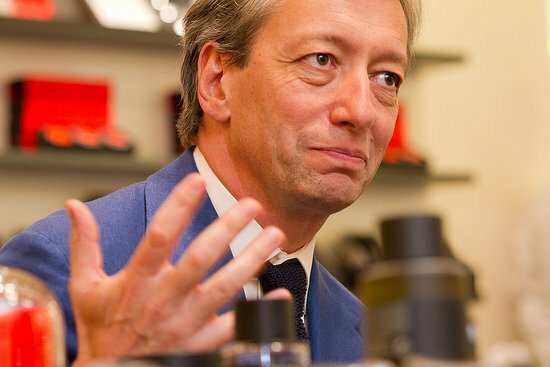 It wouldn’t be an exaggeration to say that Frederic Malle is the godfather of modern perfume. He was responsible for the first collections to champion the perfumer, back when designer brands were just starting to conquer the world. Frederic is also a smart dresser, an Anderson & Sheppard customer and a long-time friend of Audie Charles. It is his Café Society that is the unmistakable smell of the A&S haberdashery. I’ve wanted to meet Frederic for a while, being a wearer of Bois d’Orage (or French Lover, as it is unfortunately known in Europe) among other things. We were given an online-exclusive interview during his recent visit to London. PS: Let’s start with the basics of selecting a scent; I know it’s the thing most readers ask about. What would be your starting points? FM: Brands are a decent place to start. Aside from our collection, others I’d recommend are the Chanel Exclusifs, the Tom Ford private blends, although they are all quite heavy, Serge Lutens of course, and some of the Annick Goutal range. The next step is to go into a good store, such as Liberty’s, and start a conversation. Talk to the assistant and be honest about how and why you use perfume. If the assistant is good, they will also take note of things you are not saying. Like how demonstrative you are, how outgoing: whether you’re a buttoned-up Englishman or a Spanish guy with hair spilling out of your shirt. Try on one or two perfumes, and then walk around the store for 20 minutes. After that it will have settled and you should have some confidence in whether you like it. If it still appeals, it will do for a long time; if it irritates you, it will never stop. Is it a gradual process too? Yes – it’s about getting to know yourself over time. Again, it’s like clothes. You start out copying people – your father’s suit, your friend’s blazer – and then by wearing their style you learn what you like and don’t. It’s a journey of self-discovery like any other. Is it worth knowing a little of the language of perfume? To an extent, yes. It helps explain to someone – perhaps that assistant in Liberty’s – what kind of things you like. There are four rough groups of scents for men: colognes, woods, leathers and orientals. Among colognes I would recommend our two of course, Cologne Indelible and Bigarade, but Eau d’Orange Verte from Hermes is also nice. I still like Eau Savage too but it’s a little out of fashion. Among woods Terre d’Hermes is a clever fragrance, if rather commercial. The Tom Ford collection is very good on leathers, though some of them are quite similar; there’s the Hermes Poivre Samarcande too, and our French Lover. For orientals, Ambre Sultan by Serge is good, as is Sycamore from the Chanel Exclusifs line – it’s a woody oriental. Is any type of scent more suited to classical dress, or men that like to dress more formally? Not particularly, but certainly avoid all the mainstream commercial fragrances. That line that runs straight from Clear Water, into Acqua di Gio, and then through most modern male perfumes. They’re all a little bland, a little sweet. Have you ever wondered why designer fragrances all smell the same? It’s because they’re put together by focus group. Companies grab people at Victoria train station, take them to a hotel, and then make them smell a dozen things, saying which they like and why. It’s the job of the noses to narrow it down to what people like best: to please the lowest common denominator and therefore create the biggest possible international market. It’s not an easy job; it involves tiny variations in the proportions. But it’s not creative or original. How long has that been the dominant method of developing fragrances? Since the early 1990s. A trend began then for self-service counters, which took the assistant out of the equation, and at the same time globalisation meant there was a much bigger potential market. Brands went after that, trying to develop fragrances with a universal appeal. 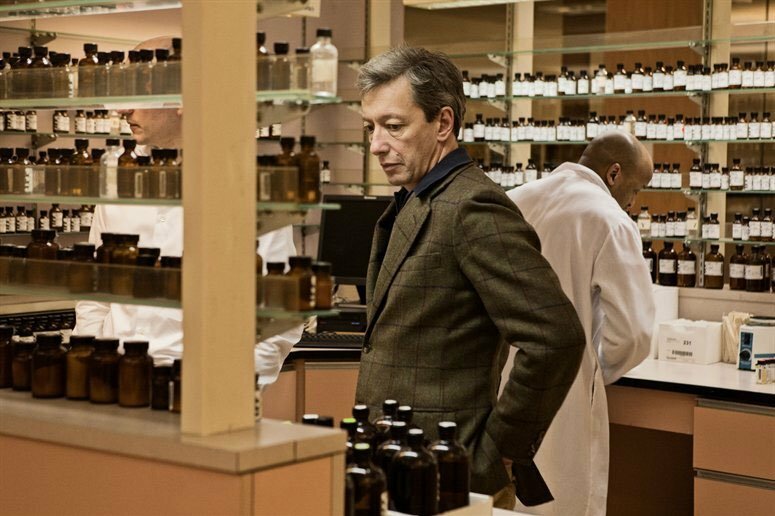 Soon after, Serge [Lutens] and I decided to go a different path, creating scents the old way, where the only aim was to make something beautiful and original. People thought we were crazy, turning left when everyone else was going right. But today you can see how many boutique collections there are. In fact I was in Fortnum & Mason this afternoon and there were several there I had never heard of. Does that bode well for the future? It’s a positive sign, yes. Although the biggest problem is so many perfumers have been brought up on the mainstream that few have the originality and training to actually produce something great. 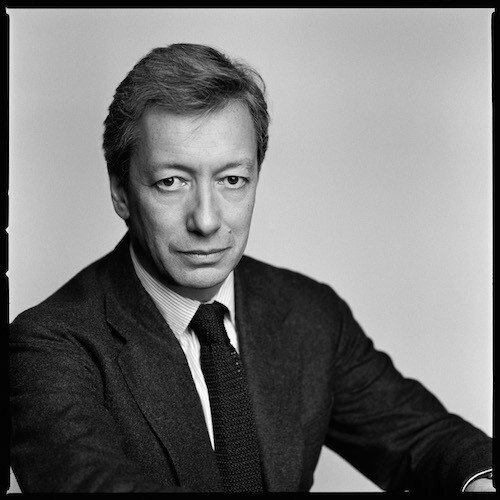 You can follow the discussion on Interview: Frederic Malle, selecting perfume by entering your email address in the box below. You will then receive an email every time a new comment is added. These will also contain a link to a page where you can stop the alerts, and remove all of your related data from the site. Lovely. I love French Lover although I find it a tad too strong and restrict use to a single squirt on the wrists. Geranium Pour Monsieur is an absolute pleasure to wear, I just love the way it develops and evolves. It is also a somewhat strange scent and I guess it takes some level of confidence to like it. Selecting a fragrance certainly is a gradual learning and growing process. Since your previous posts, I’ve found myself staying away from the more commercial (including Hermes) and ubiquitous (including Tom Ford) offerings. An interesting article with some true perspectives. That said one of the best, oldest and most discreet perfumes for men is Guerlain’s Habit Rouge eau de parfum. I invariably go back to it. For late Spring and Summer, Green Irish Tweed by Creed is fantastic. For cool late Summer nights,early Fall and early Spring Aventus also by Creed is an excellent choice. For the Winter, it doesn’t get any better than Heritage by Guerlain. I would go more into autumn for GIT. I recently went back to Eau Sauvage after a gap of about 25 years ant think that will see me into the summer. Does anybody know if samples of Malle’s fragrances are available? Give Green Irish Tweed a try. I think you’ll like it and samples are available. It is expensive,but the potency last for several years. Of course some men wear it and Aventus year round. I’ve never been that much of a fan of Green Irish Tweed I’m afraid. And being the snob I am, it puts me off that so many other people wear it too. Not a great reason not to wear a fragrance, but there you go. It’s one of the reasons I find Frederic’s quest to produce fragrances in the same way as the old classics so interesting. My experience is that Liberty is a little reluctant to give you a sample. I got one once, but they rather want to sell you a 10 ml bottle. Malle is great stuff. I use Noir Epices in winter and am impressed by their new Cologne Indelible. Malle’s words reflect what another little brand perfumer Thorsten Biehl told me. Most of what you find in department stores today is developped in order to please the lowest common denominator. Musc Ravageur is absolutely brilliant. Great interview with one of the best. Simon didn’t you recommend Green Irish Tweed on an earlier post? (2/8/13). My personal favourite is Ralph Lauren ‘safari’ (original formula) the current incarnation with the oak moss taken out is awful. I actually only wear Original Vetiver by Creed. The description of Green Irish Tweed was perhaps ambiguous though – it is a perennial favourite among men, but I don’t personally like it. I’ve been thinking about the Creed Vetiver Simon. Why does it appeal to you? I’d say one of the main reasons that Green Irish Tweed is a perennial favorite with men is because women really like it. Have you ever tried Aventus? Great post, thanks Simon. I must pop into Liberty to try out the Malle line. I’m a Creed Vetiver / eau d’oranges vertes man myself. Thank you for this article. Today’s world is truly a moving feast. I was curious that no reference was made regarding Creed. I would appreciate your thoughts about them. I’m not Simon, but personally I can’t stand Creed. In my experience, their fragrances smell cheap and synthetic, really overrated and overhyped. Aventus, while decent, is very mainstream and GIT is a primitive, macho fragrance that, to be honest, just stinks. My opinion might seem extreme but really I don’t understand why it’s such a popular brand. Its history and heritage might also be phony. As far as I know there is no record of Creed perfumes before the 1970ies. “David … you are right on the faux history. Brilliantly push all the right buttons for the luxury shopper with a fabricated back story. The company is a fraud. They love to also claim to use natural ingredients blah blah blah sourced from the Himalayas etc. Like most perfumers they use a mix of some natural and some synthetic ingredients. I recently was on Mount Street waiting for someone and went in just to pass time. You’re right its heavily synthetic smelling, wispy and a jumble of smell. Absolute waste of money. This company is one of the best examples of the consumer really buying marketing hype and following the herd. I feel slightly ashamed to admit the first aftershave I bought was GIT lol. I thought I was the bees knees wearing it although I was only 21 or so I believe at the time which is some justification for being naive 🙂 Still I think when you start scratching beneath the surface of most luxury you find its based on misconception and lies whether that be in tailoring or shoemaking, artisans included. Rups: very refreshing, I must say, to read your opinion. Creed was also among the first fragrances I tried, when I first got into it. I remember how much I wanted to like them as they seemed to tick all the right boxes: British, history, quality… But then I had to be honest with myself. I’m curious, by the way: what do you wear now? slightly off topic but any idea what green tweed (?) cloth Mr Malle is wearing in the third picture .. looking for something which looks just like that but its so difficult to find a nice green tweed cloth in a weight which wont make you sweat indoors! Anyone planning to visit Liberty in the next 24 hours make sure you avail of the offer that ends tomorrow night – £30 off a £150 spend. Makes many of these interesting scents more easily attainable. This can be used in store at the following page (I used a tinyurl as the Liberty link is a but unwieldy). I usually wear a Penhaligon’s Opus 1870 because of it’s deep wood shrouded spice, the organic nature of it’s heart notes make it so suit able for most seasons especially when there is a citrus top note. Although, they have recently released a new frana grande derived from a black Turkish rose and it smells phenomenal with hints of nutmeg and spices. I have always wondered what farmaceutica di santa maria novella brought to the table with their handmade, bespoke fragrances? Care to share an opinion? I understand that they do not make the only bespoke fragrances and cosmetics, but surely they are among the best quality out there? I know Santa Maria Novella and their facility pretty well. They are certainly not the only bespoke option – lots of others do it, including Floris in London for example. They have some nice scents too, but they are certainly not the highest quality out there, no. I think it depends how you define quality. The European Cosmetics Directive has outlawed — often for ridiculous reasons-ingredients that once removed, have made a very significant and noticeable difference to classic fragrances. The small boutique brands get away with it for a while because the fly under the radar. This is why businesses bought by LVMH, L’Oreal or P&G almost always are obliged to reformulate sooner or later. It’s made a real difference to some old classics like Eau Sauvage and Chanel Gentlemen. Yes, I’ve smelled some amazing recreations of scents that are banned for similar reasons. The scent of bacon, for example, cannot be replicated because it is ever so slightly carcinogenic (as all burnt smells are). Of course no one stops you cooking bacon, which has far greater amounts. Anyway, the only true quality measure I think you can put on a perfume is the restrictions the perfumer has in terms of time and the price of ingredients. More expensive ingredients don’t necessarily produce better scents, of course, but you can talk to perfumers like Frederic about how they are asked to cut the price of things in half, and the result that has on the depth and sophistication of the scent as cheaper ingredients would have to be used. Great post. Brought me to laughter on one point though. I guess I must make my current bottle of Aqua di Gio my last one! Don’t — if it suits you, stick with it. There is way too much manufactured snobbery when it comes to scents. Aqua di Gio was a great fragrance when it was launched and is probably still a great fragrance today. The original Brut was a fabulous perfume. As was the original Aramis. Anybody who knows this business will tell you that it’s more about luck than good management. The number of meetings that I’ve chaired over the years with young product managers running around waving fragrance sticks, telling me that this one was the new one ,created by the nose that gave us the other one tells me that the greatest of houses are lucky to have one or two true classics. Yes, the issue of classics being surreptitiously changed to comply with daft EU regulations is a real one but ‘More Than This’ as Bryan Ferry would say ‘There Is Nothing’. If you have a fragrance you love — stick with it. It defines character. My favourite Creed is Bois du Portugal. I love lavender. If one is looking for something similar to Original Vetiver then I recommend “Cologne” by Thierry Mugler. While OV is still the superior scent, Cologne is a great warm weather “splash on” and can be had at a great price. The one Creed Ive been itching to try, which has long since been discontinued, is the 1948 Vetiver. Favoured by JFK, it is apparently loved by most who have tried/owned it. I believe, as stated above, Creed has dispatched with a number of scents due to this regulation about ingredients. Hi Simon. Nice post. I did exactly what the interview states andere went to Liberty’s to try some of the Malle scents. I quite liked the Dries Van Noten scent. What is your favorite Malle scent? Sorry about asking a question on one of your relatively old posts. I have a question which to some may sound a little silly. I too went to Liberty to try some Malle’s. The assistant asked if I’d like it on the skin or on my jacket. I will be buying Bois d’orage soon. My question is should a perfume, or rather do you, wear your perfume on the clothes or on the skin. I am not a fan of dry cleaning my suits or jackets very often, in fact rarely, therefore wanted your opinion on this. Also, have you ever experienced damage to fabric/fibres from prolonged use of fragrances? I would always wear it on the skin. Spray on your chest before you put your shirt on, or on your wrists. The warmth of your skin keeps the scent emanating through the day.